In the Reports group, click the Report Wizard icon. 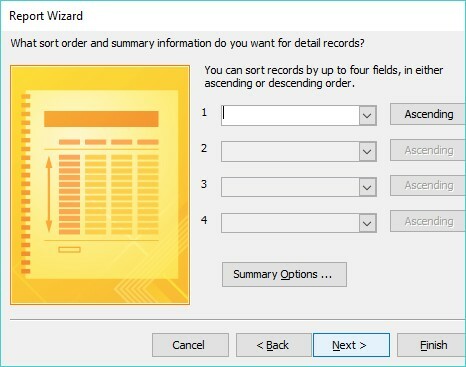 The Report Wizard dialog box appears. The Report Wizard lets you choose where to retrieve your data for your report. Click in the Tables/Queries list box and choose the table or query that contains the data you want to print in a report. Click a field in the Available Fields box and then click the > button. 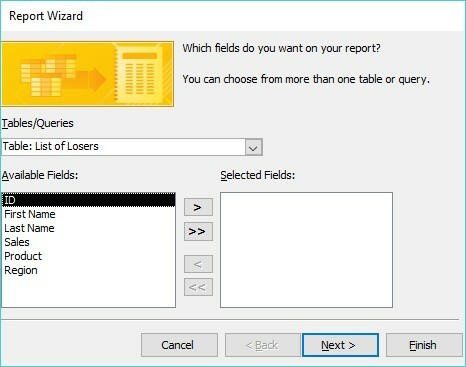 Repeat this step for each additional field you want to display in your report. 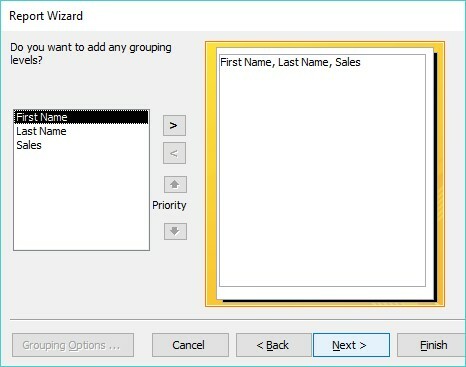 Another dialog box appears, asking whether you want to group your data by a specific field, such as by First Name, Last Name, or Sales. A report can group data under categories so you can see all your data arranged by a specific field. Click a field name displayed in the box and then click the > button. Repeat this step for each additional field you want to use to group your data on the report. Another dialog box appears, asking you to choose up to four fields to use for sorting your data in your report. You can sort the data in your report, using up to four fields. Click in a list box and choose a field to sort your data. Data will be sorted by the order chosen here for each additional field you sort on. (Optional) Click the Ascending button to change the sorting criteria from Ascending to Descending and vice versa. Another dialog box appears, asking you how to lay out your report. 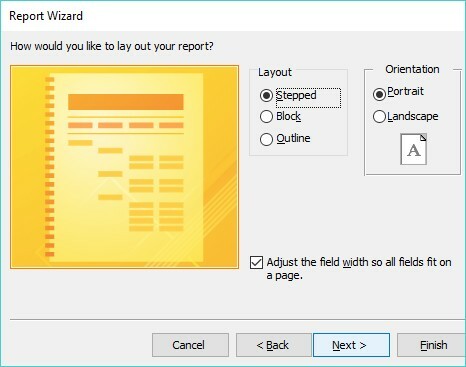 The Report Wizard offers different options for making your report look readable. In the Layout group. select a radio button, such as Stepped or Block. You may see different options depending on the fields you chose in the previous steps. (Optional) In the Orientation group, select the Portrait or Landscape radio button. Another dialog box appears, asking for a descriptive name for your report. Type a descriptive name for your report and then click Finish. Right-click the tab that represents your currently displayed report. In the left pane of the Access window, double-click the report name. Your chosen report appears again, displaying any data you updated or modified since the last time you viewed the report. Access won’t automatically update your reports just because you modified data that the report displays.